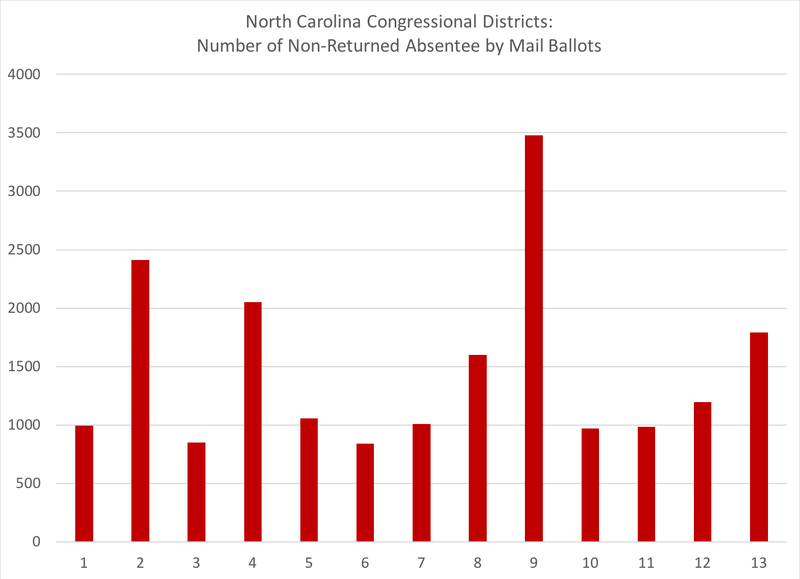 With the national attention that the Old North State's Ninth Congressional District is getting this past week and will likely get in the next few days, I thought it would be good to give some comparison perspective and an overview of the main issue at hand: the absentee by mail ballots in the 9th and what we know about them, from a data point of view. For those unfamiliar with North Carolina voting methods, there are three methods that are most used by North Carolina registered voters to cast a ballot with: in-person on Election Day, in-person through early voting (known as absentee one-stop), and through absentee by mail (ABM). 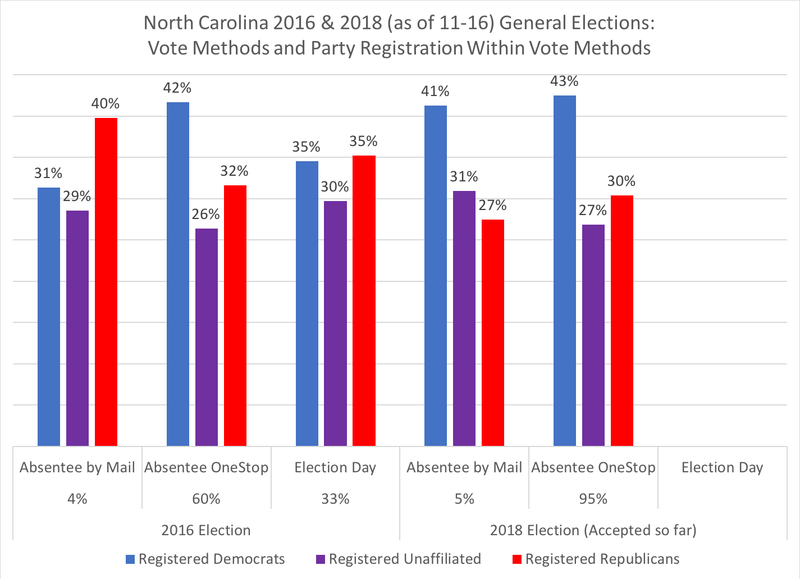 With a record turnout for a blue-moon election cycle in the state, 2018's mid-term election saw the first time that more ballots were cast before Election Day than in recent elections. Typically, this is true in NC's presidential elections, but mid-terms tend to be ones that see the majority of ballots come on Election Day, rather than prior. This year was substantially different, as was the case that several congressional contests were notably competitive (the 9th, 13th, and 2nd), despite the normal partisan advantage given to these districts. While the numbers were almost double for the one-stop/in-person method, more North Carolinians also requested and returned absentee by mail ballots than four years ago. 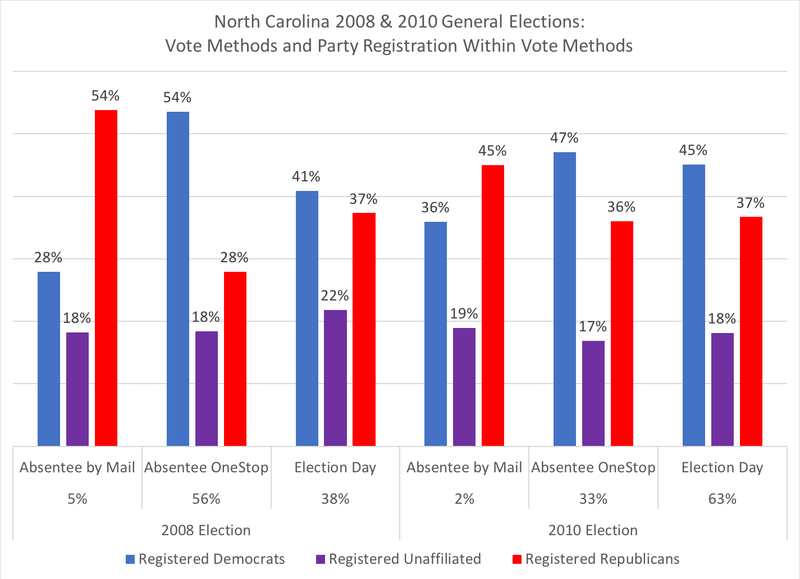 And there was a distinct partisan difference in the voting methods than in year's past as well. 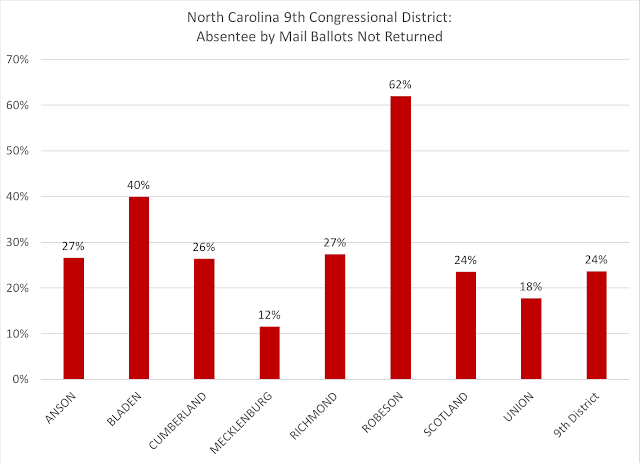 In 2008, with the Obama ground game, 61 percent of all the ballots cast came before Election Day in North Carolina, while two years later, in the mid-term, 63 percent of 2010's ballots came on Election Day. Again, 2012's presidential contest saw 61 percent of the ballots cast before Election Day, while the 2014 mid-term saw 58 percent of the ballots come on Election Day. Election Days tend to bounce back and forth or are much closer when it comes to party registrations. 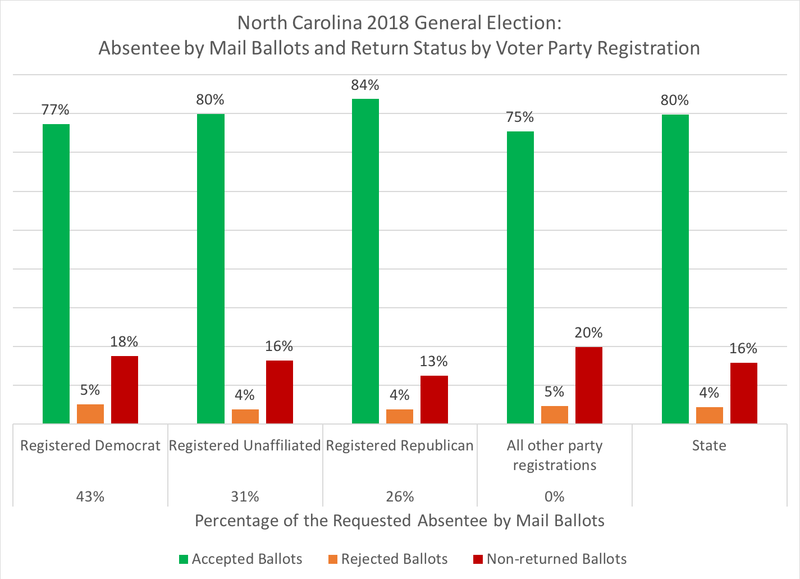 But, in 2018, Democrats, obviously through a concerted strategy and effort, got their registered voters to use absentee by mail this year, with 41 percent of the state-wide ballots being returned and accepted, while registered Republicans saw their historic advantage slip to third behind registered unaffiliated voters requesting and returning their absentee by mail ballots for accepted votes. when the county board receives the ballot, it notes the date and, following a review of the ballot and the various requirements the voter was to complete, will accept the ballot as a vote and process it on Election Day. 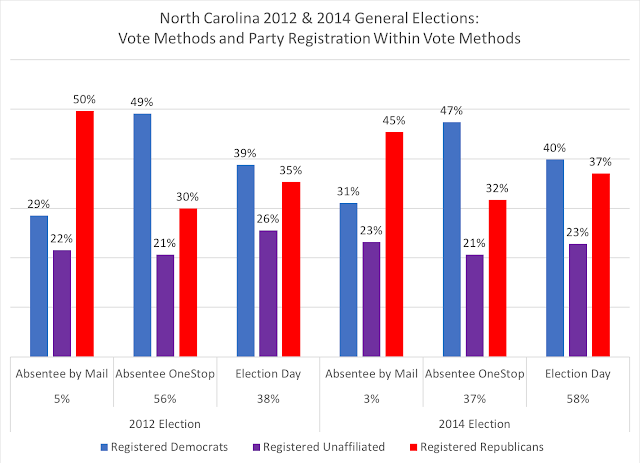 Through the courtesy of the North Carolina State Board of Elections and Ethics Enforcement, all of this data and records for each voter is recorded in a file that is publicly available each morning during the voting period leading up to Election Day and beyond. This file ("absentee_20181106.zip") is what I use to conduct the following analysis, open to anyone with sufficient computing power. With that, I'll give an overview of the absentee by mail data, starting with the "big picture" of the entire state, drilling down into the 9th District, and then finally into various counties within the 9th, especially focusing on Bladen and Robeson counties. I'll do this by analyzing the data for three primary factors: absentee by mail ballots that were returned and accepted, those that were returned but rejected, and those that were never returned. This analysis will be done through the lens of voter race and voter party registration. 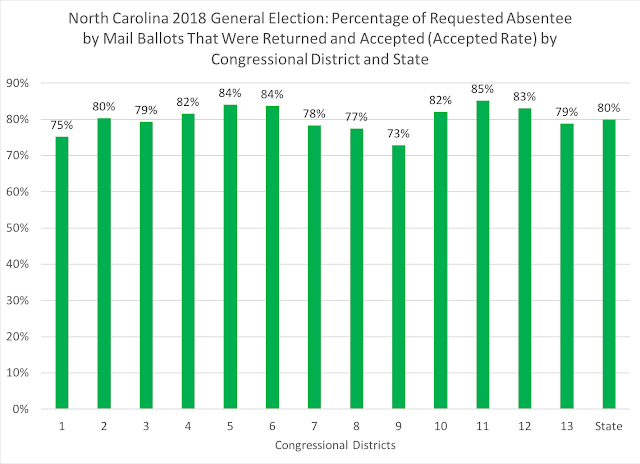 The 9th Congressional District has the distinction of being the district with the lowest accepted ABM ballot rate (73 percent) while having the highest non-return ABM rate of the 13 districts (24 percent). With nearly 3,500 requested but non-returned ABM ballots, the 9th Congressional District led the state. 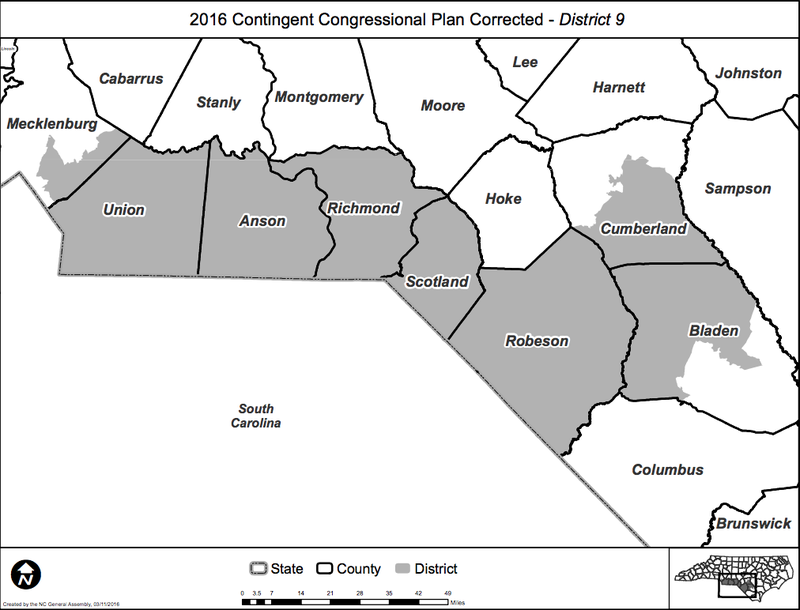 In turning to the district at the heart of the controversy, the 9th Congressional District stretches from southeast Mecklenburg County (and includes parts of Charlotte) down along the NC/SC border east to Fayetteville in Cumberland County and ends in the upper-half of Bladen County, near the coast. 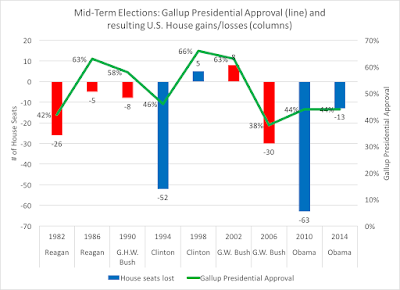 The 2018 congressional election was noted as a competitive one, even though the partisan dynamics indicated a GOP advantage. 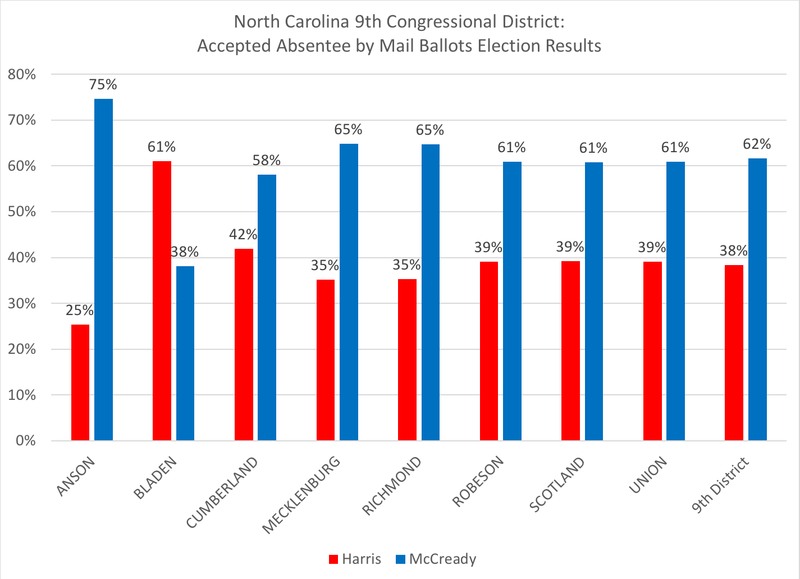 In the end, Republican Mark Harris defeated Democrat Dan McCready by 905 votes (unofficially at this point). 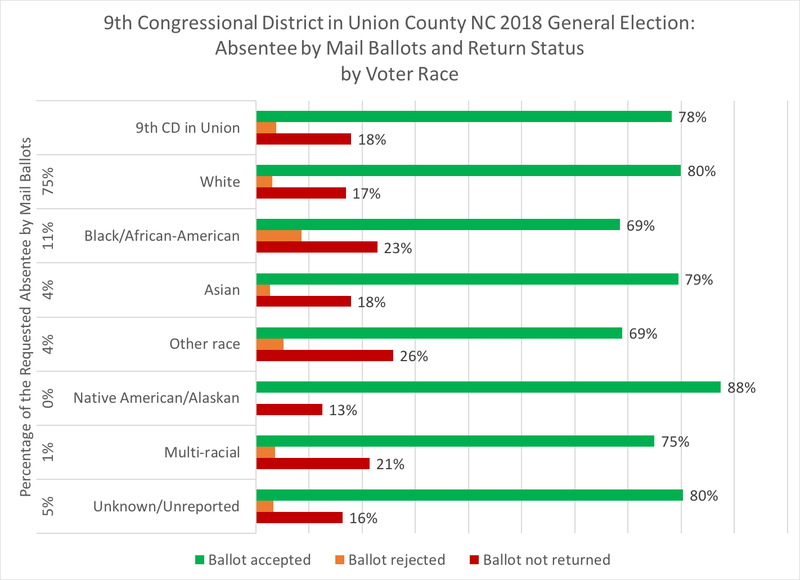 What originally piqued my interest was the decision by the NC State Board of Elections to withhold certification of the 9th district's results, and the potential issue with Bladen and Robeson counties that I was hearing about in regards to allegations of missing votes. 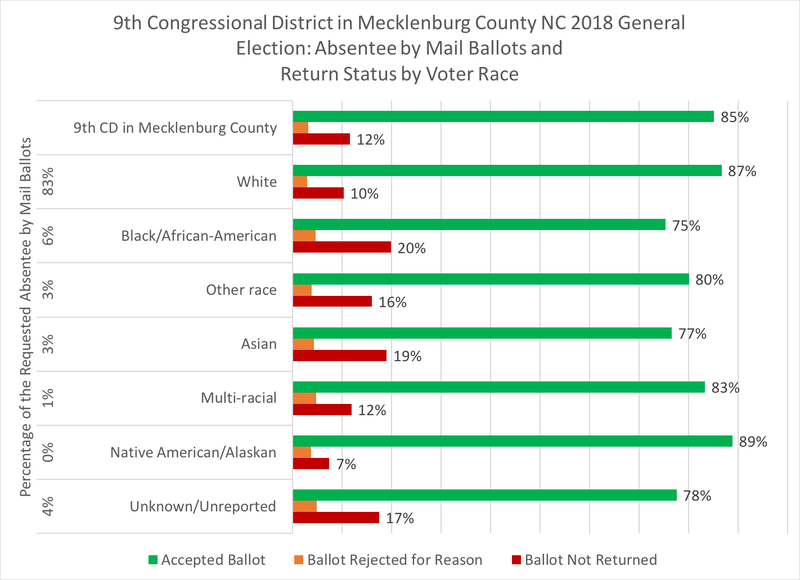 Republican Mark Harris won 61 percent even though registered Republicans accounted for only 19 percent of the county’s accepted absentee ballots. With these questions and the NC State Board of Election's 7-2 decision to initiate an investigation, I decided to break down the counties' ABMs, first for all of Bladen County, and then the portion of voters who were only in the 9th, and finally for Robeson County (the entire county is within the 9th). 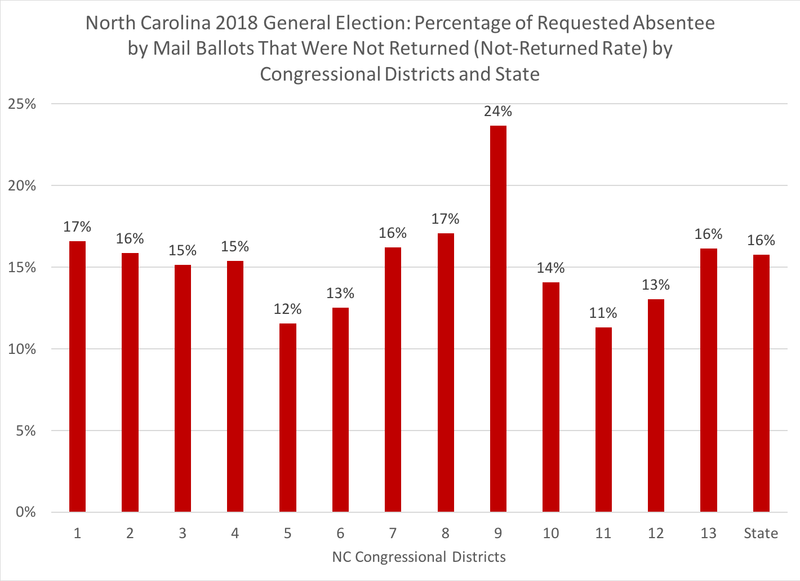 Of course, some of the "non-return ballot" voters could have used in-person voting on Election Day if they didn't get their mail-in ballots, forgot to complete it, or didn't have the opportunity to complete that vote method's requirements. 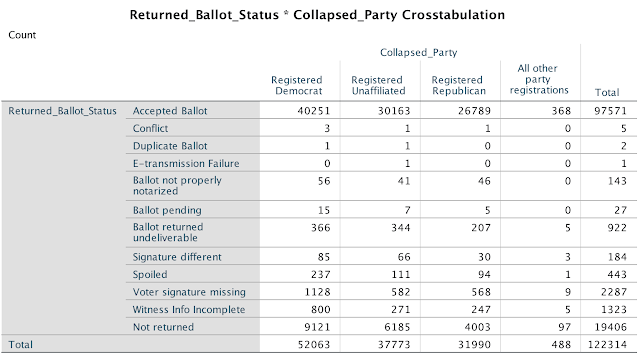 The final Election Day data is not yet finished from all the counties, so that will be another project to investigate, but in looking at all the 9th's non-returned ABM ballot registered voters (3,478), 73 percent (2,546) did not end up casting an Election Day vote (either in-person, provisional, transfer, or curbside). So, over 2,500 voters who requested absentee by mail ballots--but did not return those ballots--did not end up voting in the 2018 Ninth Congressional District election. 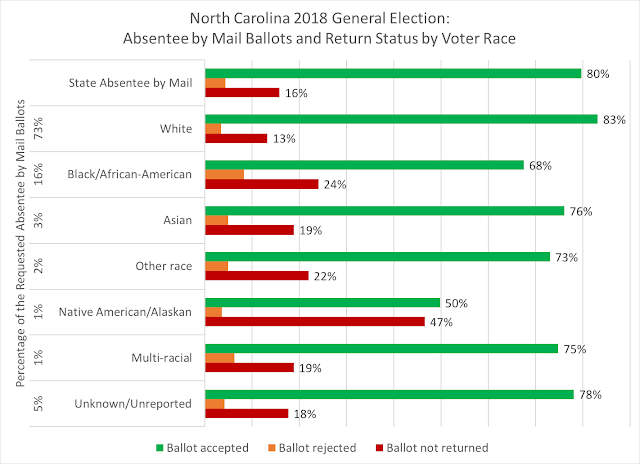 Taking the idea of voters who didn't return their absentee by mail ballots and whether they voted in the 2018 election on Election Day, preliminary numbers show that out of 1,675 "non-return ABM" 9th CD voters in Bladen and Robeson counties, 1,192 did not cast a ballot on Election Day, while 483 did cast a ballot on Election Day. Thus, the focus on these two counties and their rates by both voter party registration and voter race. 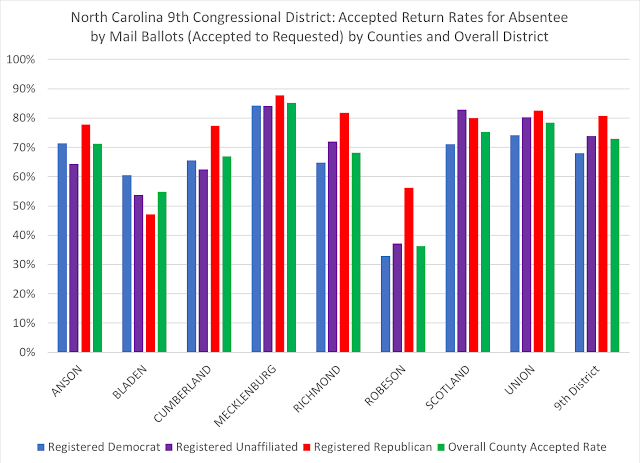 Two counties within the 9th Congressional District stuck out to me in regards to their non-returned ABM rate. 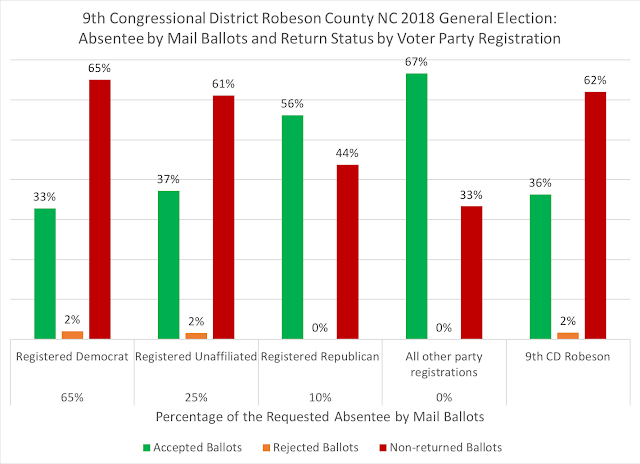 Within Robeson County, 62 percent of the requested absentee by mail ballots were not returned, making it the highest county in the 9th District with that non-return rate percentage. The county with the second highest non-return rate percentage of requested ABMs in the 9th was Bladen County. 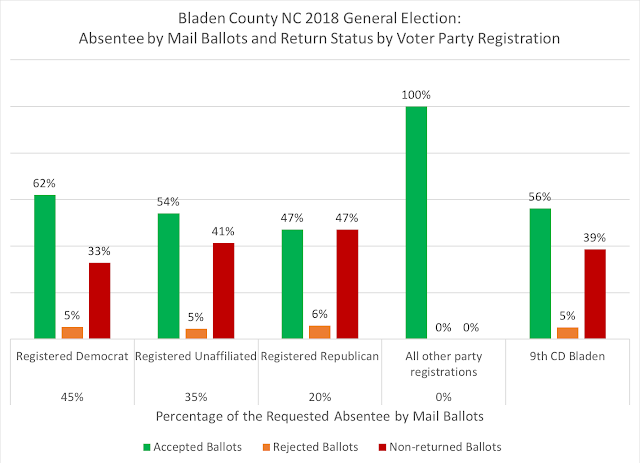 Across Bladen County, 61 percent of the absentee by mail (ABMs) ballots were returned (56 percent accepted and 5 percent rejected), with nearly 40 percent not returned. But by party registration, Bladen County registered Republicans had a higher than county-wide average for not returning their ballots, while registered Democrats had a higher than county-wide average for returning and having their ballots accepted. Over a third of registered Democrats in Bladen's 9th Congressional District did not return their ballots, while 41 percent of registered unaffiliateds and 47 percent of registered Republicans did not return their ABM ballots. 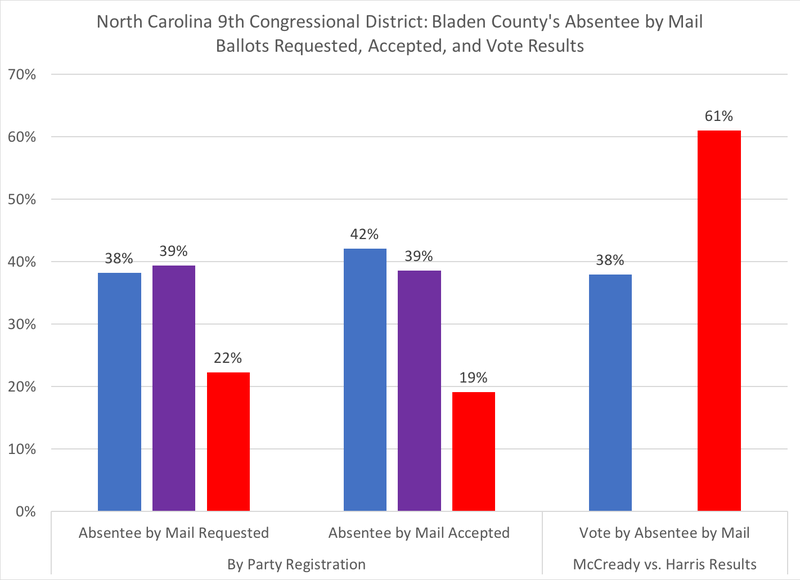 Bladen County registered Democrats in the 9th had the highest return and accepted ballot rate, while 54 percent of registered unaffiliateds and 47 percent of registered Republicans returned their ballots and were accepted. In terms of real numbers, 164 of the 473 registered Democrats in Bladen's 9th District didn't return their ballots, while 202 out of 487 registered unaffiliateds didn't return their ballots, and 129 out of 276 registered Republicans did not return their ballots. The main observation would be that Bladen's 9th Congressional District ABMs had a higher than state and 9th district non-return rates, but there were differences among the registered parties, in both percentages and raw numbers. While percentage-wise, registered Republicans appear to have suffered the most, registered unaffiliated and Democratic voters had more (in actual numbers) of ABM ballots not returned. In terms of raw numbers, 802 out of 1,232 registered Democrats didn't return their ballots, 296 out of 484 registered unaffiliated didn't return their ABMs, and 81 out of 185 registered Republicans didn't return their ABMs in Robeson County. 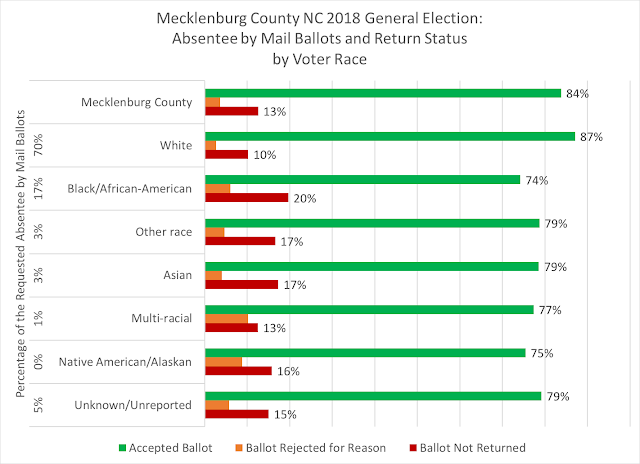 I decided to look at two other counties within the 9th which produced the largest percentage of votes in the election: Mecklenburg and Union counties. The 9th in Mecklenburg had a slightly higher accepted rate and lower non-return rate, while the party registration percentages were nearly the same between the 9th and the full county. 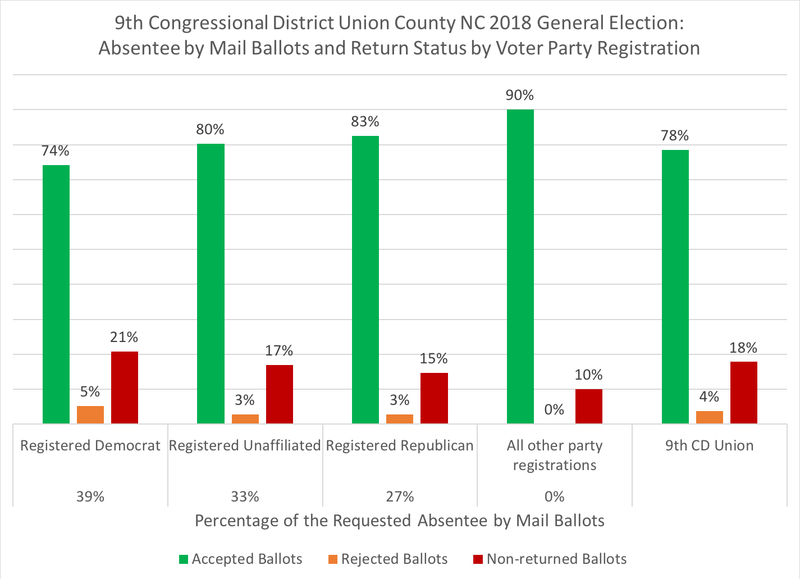 In comparison to Mecklenburg's 9th district component, Union had a slightly lower accepted ballot rate and higher non-returned ballot rate for its absentee by mail ballots, with some variation amongst the party registrations. 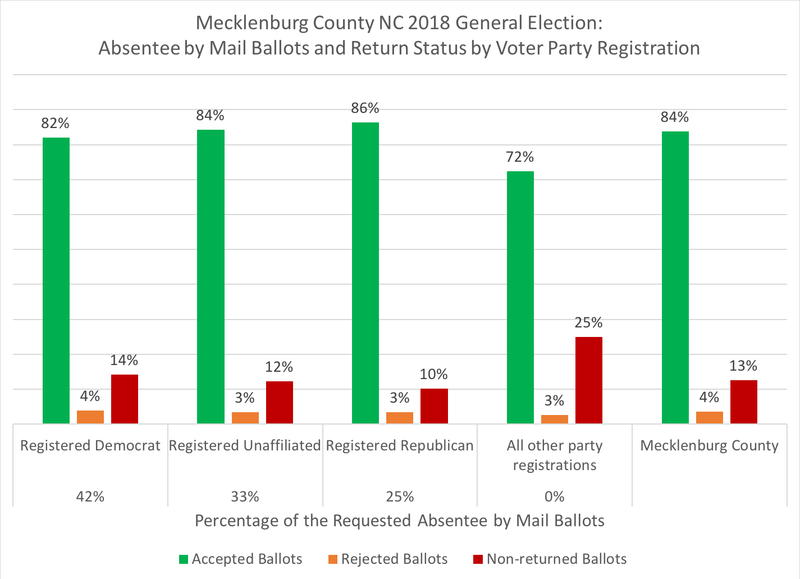 While party registration may give some indications regarding the use of absentee by mail vote methods, another factor that may give insight is the voter's race within the counties. That is where the analysis next turns. State-wide, white voters generally had a higher ballot accepted rate, while black/African-American voters had a lower rate than the state's overall rate, and Native American voters had the lowest, with only a majority of requested ballots being returned and accepted. 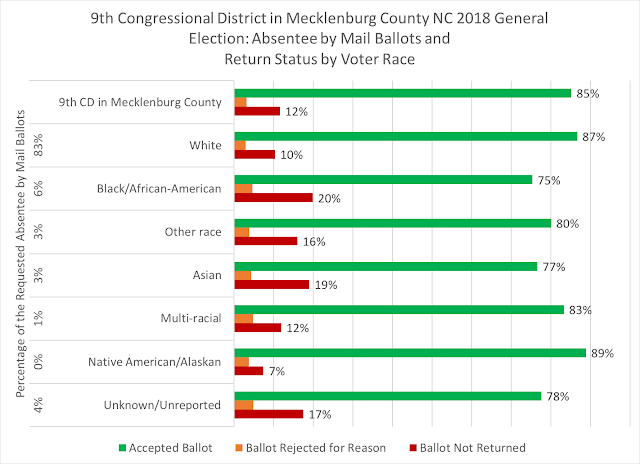 In the 9th, whites again had an above average accepted ballot rate for the district, while black voters had a rate of 54 percent and Native Americans were at 38 percent and a non-return ballot rate of 61 percent. 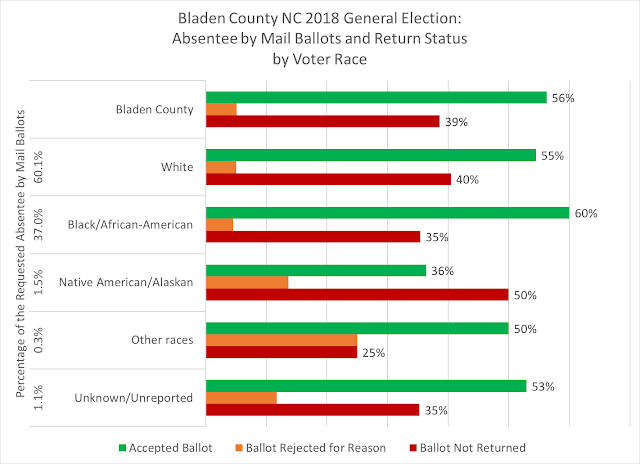 In turning to all of Bladen County, 56 percent of voters who requested absentee by mail ballots returned them and had the ballots accepted, with black voters having the highest percentage of the groups with an accepted ballot rate. Half of the Native American voters did not return their ballots, but their percentage of the ABM electorate was 1.5 percent of requested ballots. 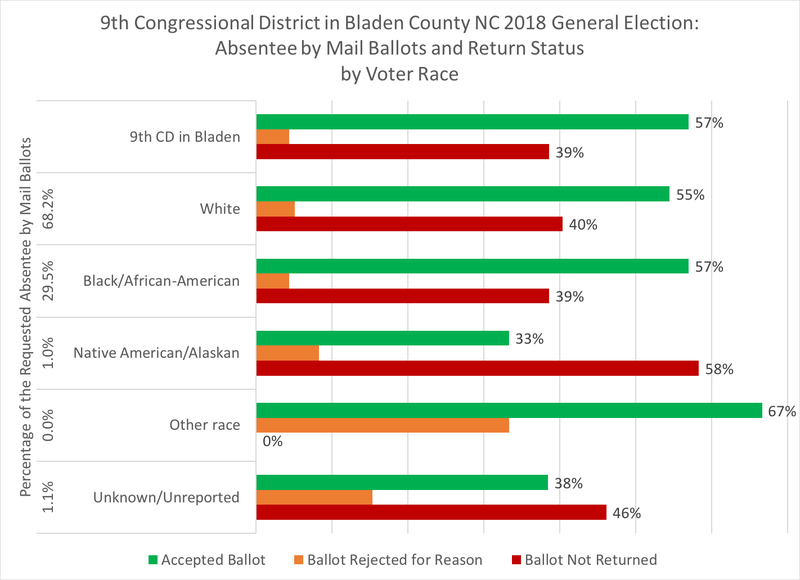 With Bladen's 9th District, white and black voters had similar accepted ballot rates and non-return ballot rates. While black voters were a plurality of the requested ABMs, a little over a quarter of those ballots were returned and accepted, while barely a third of the ballots from Native American voters were returned and accepted. 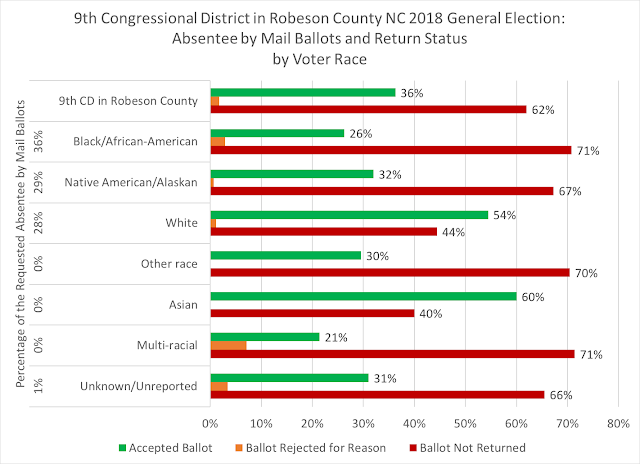 White voters in Robeson had an accepted ballot rate of 54 percent. 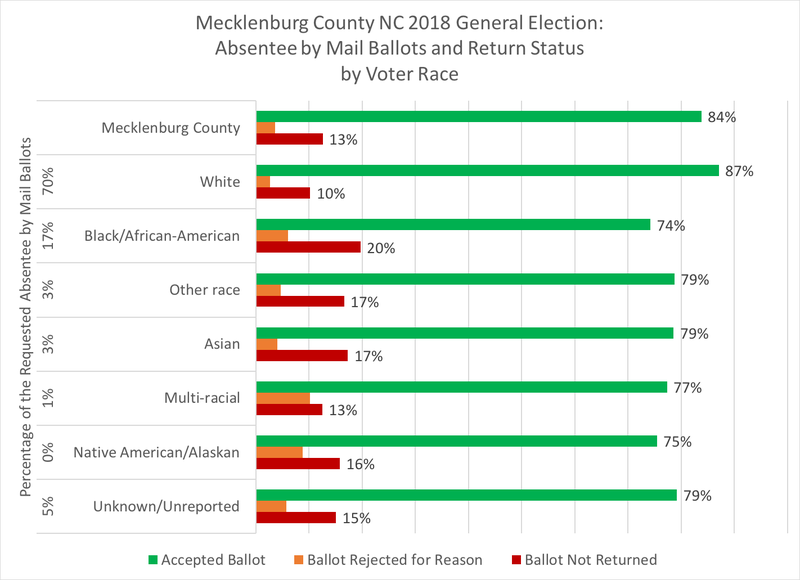 Again, much like with the voter party registration, there is not as great disparities between racial groups, but black Mecklenburg voters in the county and in the 9th did have a higher non-return rate. While the allegations of suspected voter fraud, mainly by collecting, sometimes called "harvesting," absentee by mail ballots, is currently under investigation, the data shows that two counties--Bladen and Robeson--have potentially enough anomalies in their absentee by mail rates--both in accepted and non-return--that may warrant greater inspection. 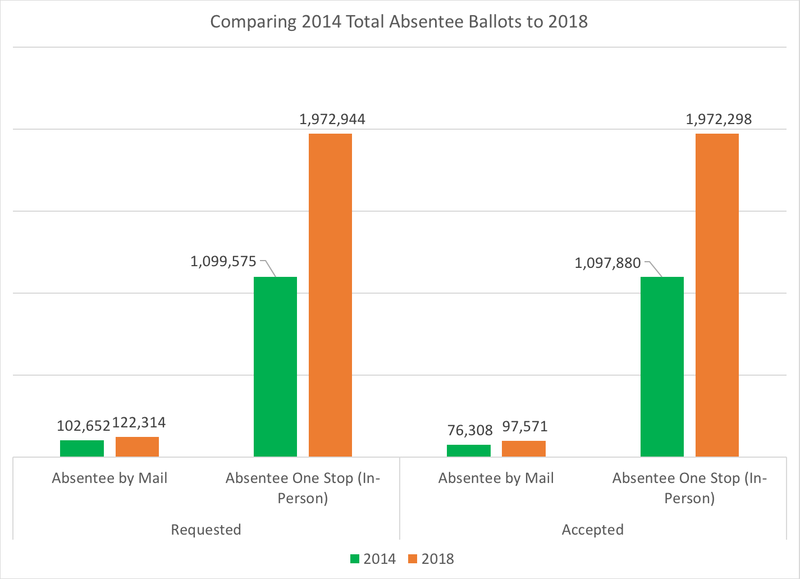 Perhaps voters in these two counties simply decided to request, but never return, their absentee by mail ballots; it may be as simple as that. 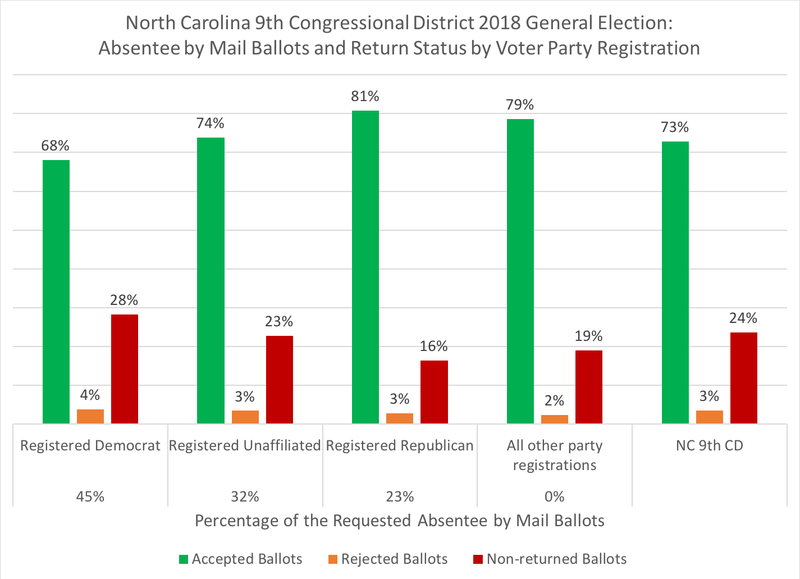 It could also be that the campaigns, on both sides of the political fence, failed to motivate and/or follow-up with their ABM voters to get their ballots completed and returned; it could be as simple as that as well. 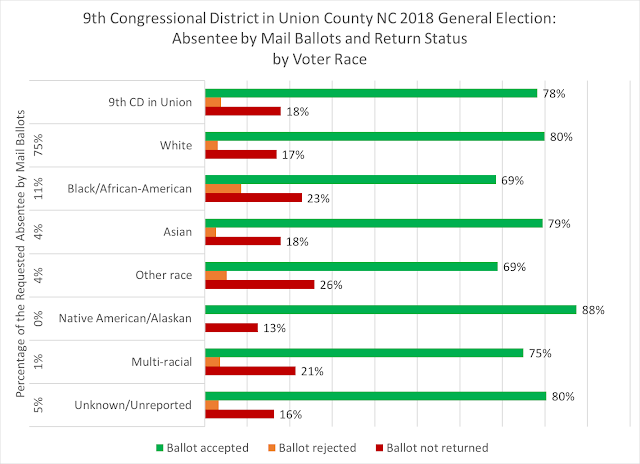 Maybe it's the fact that both Bladen and Robeson voters (two rural counties) are just that different from Mecklenburg (urban) and Union (suburban) voters in having a different approach to voting; it could be as simple as that. 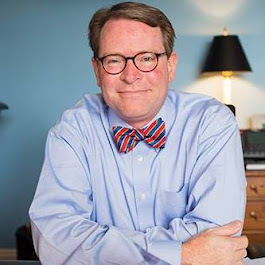 But if there are other issues at hand than voters simply not returning their own ballots, the integrity of the voting process in the 9th Congressional District's election may be called into question. Ineligible voters sufficient in number to change the outcome of the election were allowed to vote in the election, and it is not possible from examination of the official ballots to determine how those ineligible voters voted and to correct the totals. Eligible voters sufficient in number to change the outcome of the election were improperly prevented from voting. Other irregularities affected a sufficient number of votes to change the outcome of the election. Irregularities or improprieties occurred to such an extent that they taint the results of the entire election and cast doubt on its fairness. Nowhere in the statute does the Board have the power to certify an election because the number of questionable ballots would not produce a change in the overall election. But this will not prevent one side from arguing that the election should be finalized and certified, while the other side will contend that enough irregularities or improprieties have occurred to question, or 'taint,' the 9th's results. 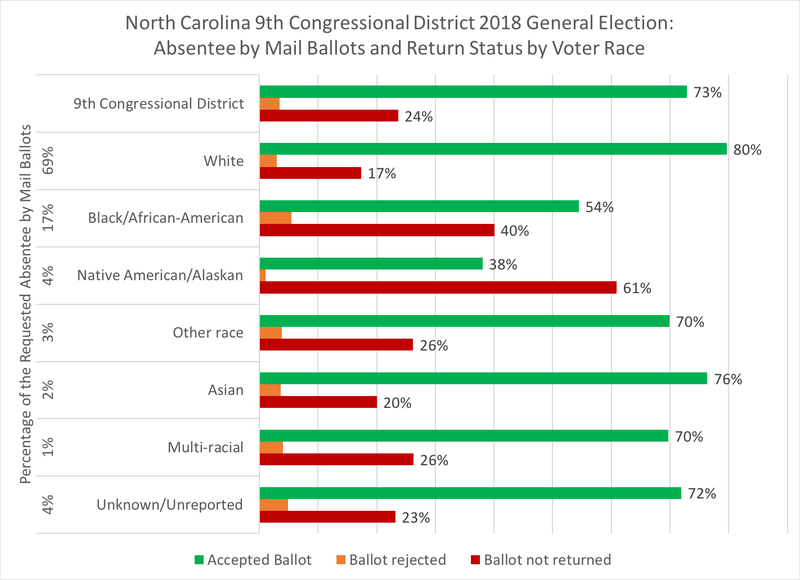 Needless to say, in North Carolina's hyper-polarized environment, this potential dispute over an extremely competitive election could only further divide the partisans. As the national media has begun to cover this story over the past week, I ended a conversation with a reporter last week when she noted that I lived in a very "exciting state." I could only respond with "oh, you have no idea." Now...What's Next in North Carolina's Ninth?